Stephen King thriller 11.22.63 will be available to stream exclusively on Stan, hours after it’s released in the US. 11.22.63 is a eight-part TV mini-series based on the Stephen King book of the same name, about a time traveller attempting to stop the assassination of JFK in Dallas, Texas — the title is a reference to the date when JFK was killed. You’ll be able to watch the show within hours of its US broadcast on Stan, and probably on Australia’s free-to-air TV networks a couple of months after that. Stan has also picked up the rights to the US show called Billions. it’s a GREAT show - all about greed and wall street… Nine are actually showing it tonight after the T20. ^ Nine only showed the first episode last night, just like how it did with Transparent 12 months ago. Billions was renewed for the second season by Showtime overnight. Thanks for the heads up. I saw no promotion of this. hope you got to it in time, I saw the first few eps, the rest are on my wait list. Yes I did, the IceTV guide was still showing a movie, but I just caught all of it. Will probably re-join Stan when Better Call Saul returns and watch the rest of Billions. Over the course of the new agreement, hundreds of hours of quality Showtime programming will also become exclusively available on Stan on SVOD, including award-winning and critically acclaimed hits such as HOUSE OF LIES, THE AFFAIR, PENNY DREADFUL, RAY DONOVAN, DEXTER® and CALIFORNICATION. Current rights with other platforms will remain unchanged, with series migrating to Stan for SVOD as permitted when existing commitments expire. In addition to Showtime programming, the deal will also include exclusive SVOD rights to acclaimed CBS and The CW series such as MADAM SECRETARY, LIMITLESS, ELEMENTARY, SCORPION, UNDER THE DOME, EXTANT, BEAUTY AND THE BEAST and REIGN. Every episode of every STAR TREK television series will also be available on Stan. TWIN PEAKS is widely considered to be one of the most groundbreaking programs ever made. Creators David Lynch and Mark Frost now continue the story 25 years after the quaint northwestern town of Twin Peaks was left stunned by the murder of homecoming queen Laura Palmer. In addition to Showtime programming, the deal will also include exclusive SVOD rights to acclaimed CBS and The CW series such as MADAM SECRETARY, LIMITLESS, ELEMENTARY, SCORPION, UNDER THE DOME, EXTANT, BEAUTY AND THE BEAST and REIGN. That’s going to cause Ten some bother. Especially given Ten has an existing output deal with CBS and they co-own Eleven. Ten surely will not show Stan advertisements promoting the latter having SVOD rights to Madam Secretary etc. Why would it affect Ten? They have the broadcast rights, not the SVOD rights. Well repeats on Ten would be a waste of money for starters so they will be less likely to purchase repeats rights. I don’t get what you are saying. Someone was going to buy the SVOD rights to these shows, what difference does it make to Ten if it was Stan or Presto or Netflix? As far as repeats are concerned, Presto has SVOD rights to Big Bang and Modern Family and that doesn’t seem to have any effect on how many FTA repeats there are of those shows. What I’m saying is that I think it might impact the networks in the future. If you subscribe to a streaming service and can watch any episodes at any time, why would you watch network repeats with adverts? This new deal also give showcase and Foxtel less content which is interesting that they use to have hbo and Showtime content now it’s just HBO. I think stan is going well. I actually like it as equally as Netflix. Someone was going to buy the SVOD rights to these shows, what difference does it make to Ten if it was Stan or Presto or Netflix? According to The Australian, Optus has linked up with Stan, ending a three-year distribution deal with Netflix. The article says Optus will offer three months of free subscription to Stan to existing and new customers on broadband plans, and could even enlist Stan to stream English Premier League matches in HD. 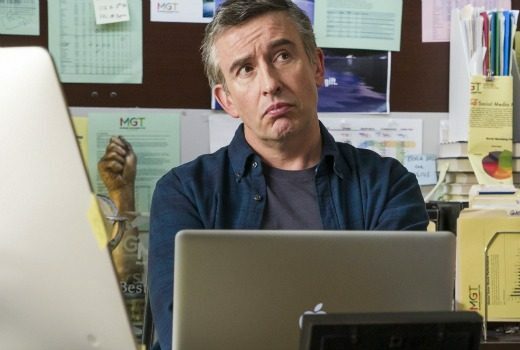 Steve Coogan stars as a depressed advertising exec challenged by younger bosses in a new comedy coming to Stan. This was a cancelled series. Looks sort of like it could be worth watching. Obviously isn’t Billions or one of Showtime’s hit shows but worth a look nonetheless.